However, while I am usually just a bit untidy as a person and thus end up making a mess of my room, this is purposeful mess-making. Do you even know how often I wish I’d been able to say that? Like yes, there is a reason that my room is messy, and it is an actual legitimate reason. So why exactly is my room a huge mess? Let me tell you. I decided yesterday that I would do a little trial packing for uni. 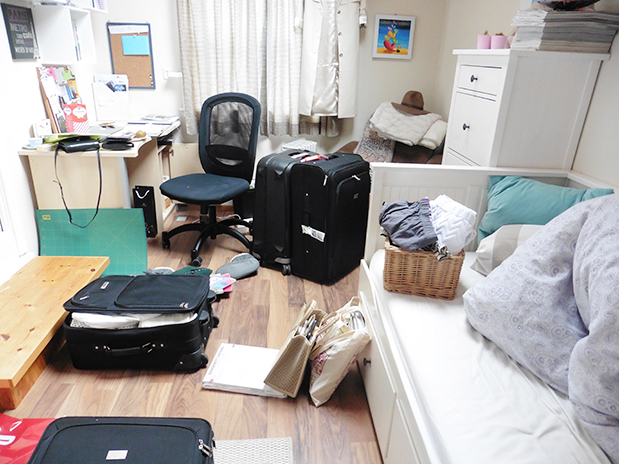 Since I’m studying abroad I’ll be going there by plane, and my room for packing is thus a ‘lil bit limited. Fortunately my parents are coming with me, so I’ll have three large suitcases and a carry-on suitcase to my disposal. Well, when I’d successfully demonstrated that my entire wardrobe (minus outerwear and shoes) fit into the carry-on and one of the large suitcases, I realised that the chances of me unpacking everything just to repack it in 9 (!!!!!!!!!!) days is pretty slim. So now I’ve just fully started packing. I haven’t actually started putting anything but clothes in the suitcases, but I’ve picked out what I’m bringing and I’m just trying to figure out what will be the best way to pack it. This includes stationery, towels, some sheets, outerwear, shoes and bags. And three mugs. But that’s really it. I’ll go more into debt about this whole thing next week in my 5 day college countdown vlogs. It’s supposed to be seven days, but I’ve adapted everything to suit my situation. You can also expect a lot of ranting in those, because my head is just spinning these days. I really can’t believe I’m leaving soon. But that sentence is the start of the rant I’ve had many times, and unless I can’t contain myself, you’ll have to wait for next Thursday to get it. For now, I’m gonna get back to packing and I hope you have a great day!